A beautiful Christmas tree set in the middle of a Provençal nativity scene in the ITER lobby has brought the festive season to ITER. The tree is a gift of the mayor of Saint-Paul-Lez-Durance, Roger Pizot, who turned the switch in the traditional tree lighting ceremony on Friday last week, in the presence of Director-General Bernard Bigot and ITER staff. Roger Pizot (left), the mayor of Saint-Paul-Lez-Durance, lights the Christmas tree he traditionally gifts to ITER. Look closely for the ITER scientist to the right of the nativity scene. 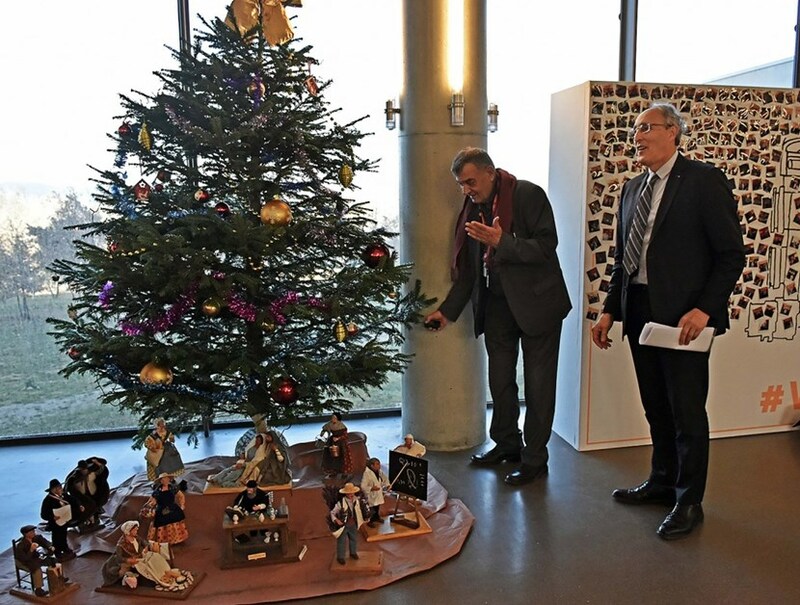 Expressing his appreciation and thanks, Bigot said that "the tree symbolizes Mr. Pizot's generosity towards ITER and his continuous and strong support for ITER in the community." A keen observer could spot the ITER scientists among the "santons," the little saints, traditional figurines that make up the nativity scene. Clad in a white cloak, the scientist points at a miniature blackboard and reminds us of the scientific goal of ITER—to produce 500 MW of fusion power from 50 MW of injected heating power (Q≥10).